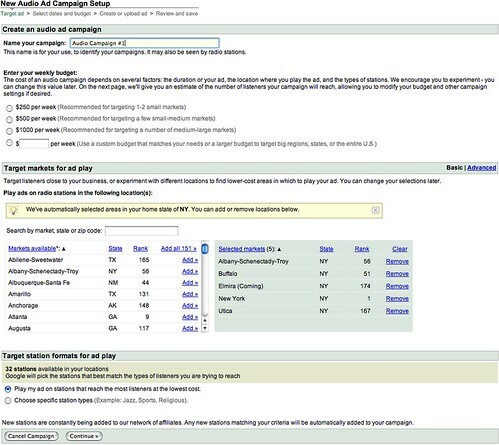 If you login to your Google AdWords account you may find a new tab at the top of your console. Many advertisers are now seeing it. Here is a screen by screen blow of all the available options I have seen in the Audio Ads section. Note, you can click on any image to see a larger one over at Flickr. When you click on the "Audio Ads" tab on the top right, you see this page. One thing that is neat about this screen, is that they automatically select your local area using their geo-targetting technology, to assign radio stations for you. We've automatically selected areas in your home state of NY. You can add or remove locations below. Another interesting point, that you do not see in the screen capture, is that at the bottom of the ad set up pages only, a copyright is set by "©2004-2007 Arbitron Inc." From Arbitron's web site. Arbitron Inc. (NYSE: ARB) is an international media and marketing research firm serving radio broadcasters, radio networks, cable companies, advertisers, advertising agencies, out-of-home advertising companies and the online radio industry in the United States and Europe. After you set the ad campaign, they ask you for when you want the ad to air. 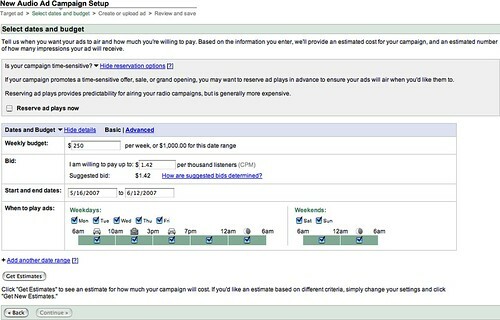 Based on that, Google can now show you budget estimates for your ad. Finally, you need to upload or have a specialist create your audio ad. Here is that screen. If you don't have an audio ad, you can use the Find a Specialist page to locate audio ad or radio ad producers in your area. 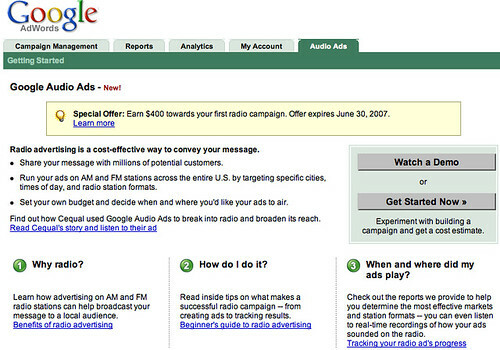 For more information on Google Audio Ads see the FAQ section. I have been running a national campaign for about 2 weeks now. I am very impressed with how Google has set this up. The reporting is top notch. You get an email in the morning telling you when your ads a scheduled to run and then throughout the day you can see when the ad actually ran. Seems to be very targeted so far, been getting a ton of plays on stations across the country (US). Just like with anything else, the less you spend the worse the ads are. When I lower the cpm I end up with a lot of ads in Alaska between 1am and 3am. but I’m ok with that for testing purposes. As for roi, not sure how that would be. I am only testing the ads on a pet project of mine and strictly for branding. Another member added, "What we have found is that radio is great for branding, but the AdWords text ads are generating the conversions not radio."